Jones, Ronald. "Will Kwan." Artforum, May 2012. Peckham, Robin. "Digital Politics." ArtSlant, 30 Jan 2012. Chappa, Kirsten. "Fire with Fire." In Common Love: Aesthetics of Becoming in Contemporary Art. Exhibition catalogue. Kaira Cabañas (ed). New York: Miriam and Ira D. Wallach Art Gallery, Columbia University, 2011, 51-63. Kanamitsu, Tomoko. "Letting Go of Nature." In Common Love: Aesthetics of Becoming in Contemporary Art. Exhibition catalogue. Kaira Cabañas (ed). New York: Miriam and Ira D. Wallach Art Gallery, Columbia University, 2011, 28-49. Roundtable discussion, "Art, Politics, and Love." In Common Love: Aesthetics of Becoming in Contemporary Art. Exhibition catalogue. Kaira Cabañas (ed). New York: Miriam and Ira D. Wallach Art Gallery, Columbia University, 2011, 94-101. Cho, Seon Ryeong. "Will Kwan: Displacement (With Chinese Characteristics)." In A Monumental Tour. Exhibition catalogue. Seon Ryeong Cho. Seoul: Space*C, Coreana Museum of Art, 2010, 33-34. Davis, Laura. “Will Kwan creates wall of burning flags at Scandinavian Hotel for Liverpool Biennial.” Liverpool Daily Post, 1 September 2010. Killackey, Fiona. “Will Kwan and a World of Infinite Identity.” Flux Magazine, Autumn 2010. Kwan, Will. “Research in Motion: An Interview with Will Kwan.” By Alissa Firth-Eagland and Johan Lundh. Yishu Journal of Contemporary Chinese Art, Volume 9, Issue 2, 2010. Legge, Laura. “Mining the Archive: Connecting concept and narrative in the work of Will Kwan.” Hart Beat Magazine, Volume 11, Issue 2, 2010. Loeffler, Frances. "Will Kwan: Flame Test, 2010." In 2010 Liverpool Biennial: Exhibition Guide. Liverpool Biennial of Contemporary Art, 2010, 68-69. Pickles, Helen. “Liverpool Biennial festival - North West England.” The Telegraph, 24 Sep 2010. Ward, Ossian. “Liverpool Biennial 2010.” Time Out London, September 2010. Jager, David. “Burning Issues: Will Kwan probes recession fallout.” NOW Magazine, Volume 26, Number 16, 2009. Lee, Minna. “Art with a global currency.” Canadian Art online, December 2009. Milroy, Sara. “An artist’s alternative map of the world.” The Globe and Mail, 02 December 2009. Sung, Doris and Rhee, June. “Transpulsation: New Asian Imaginings.” Published in conjunction with the exhibition Transpulsation, Gales Gallery, Toronto, CA. Whyte, Murray. 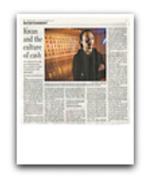 “Kwan and the culture of cash.” The Toronto Star, 15 November 2009. Baerwaldt, Wayne. "Remuer Ciel et Terre – Crack the Sky." In Remuer Ciel Et Terre – Crack the Sky: La Biennale De Montréal 2007. Exhibition catalogue. Montréal: Centre International d'art Contemporain de Montréal, 2007, 35, 43, 102-103. What time is it in Lampedusa? And more importantly, why should you care? Will Kwan knows. For his show of recent work that opened at the Justina M. Barnicke Gallery at the University of Toronto's Hart House on Thursday, Kwan installed a grid of a dozen clocks, each telling the time in places like Lampedusa, a rocky island between Italy and Libya that functions as a detention centre for African migrant workers trying to slip into Europe. There's also Sanapur, the rough slum just outside Dubai's glitzy core, where thousands of illegal labourers live; and Delft, the global design headquarters for IKEA, where, it turns out, Kwan bought the clocks. Starting to get the idea? Kwan calls it Clocks That Do Not Tell the Time, and he isn't so much redrawing the map in the wake of economic globalization as revealing the shadowy new boundaries global commerce has created that few of us know exist. Kwan's show here is called "Multi-Lateral," and the title, like the work itself, is both ambiguous and quietly compelling. Arranged in tidy rows, hotel-like, the clocks tell time at the fringes of our globalized reality; where you might expect to see Paris, London, and Tokyo – the so-called world centres – Kwan deflects your gaze behind the curtain to the machinery that allows those places to function. "It's all a sort of mapping – the symbols and ideas we use to construct our idea of the global," Kwan explains, working his way through, piece by piece. Adjacent to the clocks is a large grid of photos of bright red envelopes covered with Chinese characters and symbols. The piece is called Endless Prosperity, Eternal Accumulation, a grim parallel between Chinese proverb and global capitalism's apparent endgame. They're gift envelopes, Kwan explains, traditionally used in Chinese culture to give money on special occasions. Look closer, though, and the personal act gives way to corporate promotion: Each of the envelopes bears the logo of one international bank or another – CIBC, Barclay's, HSBC. On the surface, there's a clear sense of how international finance has infiltrated even the most intimate gesture; but beyond that, Kwan shows how the global Chinese diaspora is most easily tracked: As a target market. Born in Hong Kong in 1978 and raised in Toronto, Kwan has lived the kind of hybrid existence he portrays in his work. "Multi-Lateral" is a homecoming of sorts; living in the U.S., Asia and Europe, Kwan has re-settled here, with a teaching position at U of T. Building a trans-national career, his fascinations are both natural and timely, says Barbara Fischer, Barnicke's director. "That was obviously one reason to do this now," says Fischer, who curated Canada's entry to the Venice Biennale this year. But Kwan's topical acumen doesn't overshadow his art practice. "A lot of his work sits on a double edge," Fischer says. "He makes reference to the history of contemporary art, but he uses these formats to address a really different context and gives them a new meaning." For a 2007 piece in Shanghai, Kwan set up in one of the many rubble fields scattered throughout the city, the cast-offs of reconstruction projects that saw old neighbourhoods razed to make way for skyscrapers and shopping malls. Using the rubble, he fashioned a simple round icon, 40 feet in diameter. It's an ancient Chinese symbol for money, which, not coincidentally, is the logo for the Bank of China. The obvious echo is of Robert Smithson; the piece is called Displacement (with Chinese Characteristics), after the famed earthworks artist's "Displacements" series. But where Smithson's work was primal and idealized, Kwan's is multi-layered. Working with the remains of thousands of homes levelled to make way for foreign investment projects – condo towers, office buildings – Kwan's Displacement takes on another sinister, more literal meaning. This is not to suggest there's anything pedantic about Kwan's global investigations. Cleverly oblique, Kwan constructs tight packages layered with multiple meanings that nonetheless ring clear. Kwan's installation Canaries (The Bank and the Treasury), from 2007, features a three-channel video that intertwines ancient Taoist notions of the afterlife, global migration and the institutional life of the Hong Kong and Shanghai Banking Corporation (a.k.a. HSBC). It's a poignant investigation into the nature of faith; Taoists burn in effigy items that their departed loved ones might need in the afterlife – paper models of anything from air conditioners to cell phones to fake money. Kwan takes HSBC's iconic Hong Kong tower and commissions a paper effigy built, appropriately, in Hong Kong, London, Toronto and Vancouver. When the effigy burns, you're struck both by the humour of the surface implication – the afterlife, with its surfeit of cash and consumer goods, obviously needs a bank – and the quiet consternation that accompanies it: In a society where the only real boundaries aren't national borders, but those drawn by the channels of global capital, even the afterlife is a target market. Maybe you really can take it with you.